Carson Valley is a great couples travel destination. With much to do and see and experience and after a long weekend of fun in the winter sun, we needed to relax a bit before the three hour drive home to Northern California. David Wally’s Hot Springs provided a perfect ending to a relaxing weekend in the gorgeous Carson Valley. Upon arrival, we received our towels and locker keys. The locker rooms were modern, comfortable and roomy. We can’t stand athlete’s foot or plantar’s warts, (gross) so I would highly recommend bringing your own flip flops as the floors were rather wet and unclean. We enjoyed the various temperatures of the half dozen mineral soaking pools outside. Mark Twain did too and he even claimed the springs cured him of his ailments in 1887! All except the fresh water relaxation & swimming pool which is minimally chlorinated, the others are not chlorinated, which I particularly liked since I am a bit of a purist. 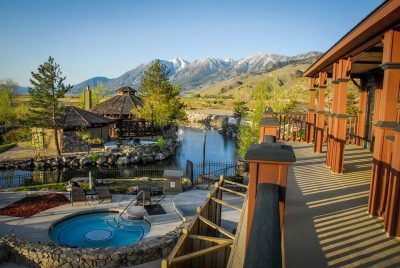 The majestic views of the high desert, cliffs, mountains and valley were mesmerizing during our romantic soaks from tub to tub in the cool and crisp mountain air. It provided a luxurious spot and lovely backdrop to sit and sip a cocktail while relaxing away stress with other couples. We met numerous friendly folks to chat with, including a local couple. It seemed during our stay to be a good mix of locals and tourists alike. All ages including young families and retired visitors seemed to mingle well as they relaxed and conversed in the varied tubs. All the tubs ranged in temperature and the maintenance crew checked them often as they seemed to fluctuate by about ten degrees even during our three hour soaking session. It was the perfect relaxing cap to a wonderful Carson Valley respite and we were finally ready to make the pilgrimage home.